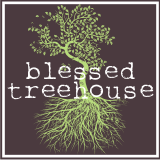 Blessed Treehouse: Because two is better than one. Or maybe it's not. I don't really know. Because two is better than one. Or maybe it's not. I don't really know. Guess how many times I blogged in 2009 (the year of my Blessed Treehouse debut)? I birthed this blog almost five years ago, and much like an aging metabolism, my blogging rhythm has slowed down. Drastically. So what I'm getting at is that one blog has been too much for me. So naturally I now have two. In my perfect world, one blog will continue to serve as my family scrapbook (say cheese!) And the other blog will serve as my brain dump (#sorrynotsorry). But my world continues to be very much imperfect. So there are no guarantees. Because let's face it, at this rate I'll have a whopping two blog posts published in 2014. Or maybe none. Or maybe 238. Or who really knows. And I know, I know, you're right. Who really flippin' cares? !